Vectornator unlocks the power of vector graphic design for everyone by bringing a high-performance rendering engine and a unique, user-friendly interface to iOS. It’s exactly what you need to create stunning artworks from anywhere. 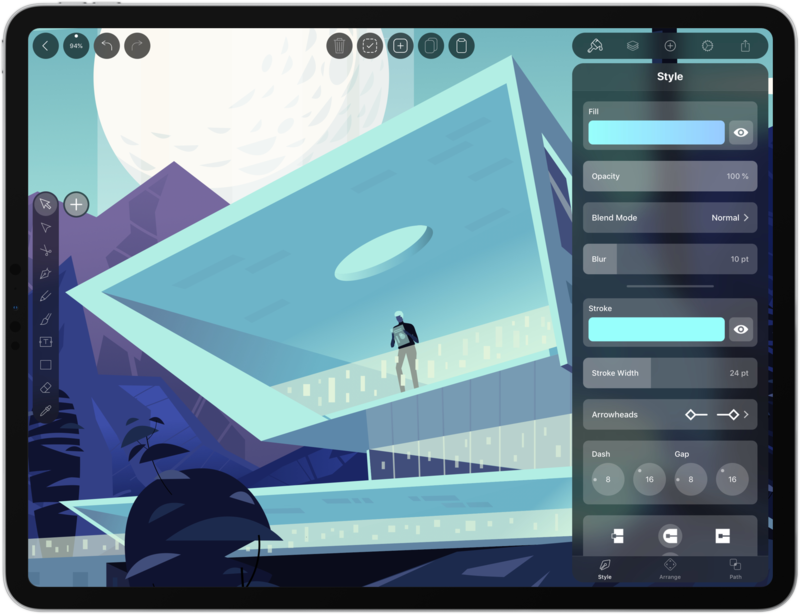 Vectornator integrates with the Adobe Creative Cloud, so you can work seamlessly between a Mac and your iOS devices. Of course the app supports the Apple Pencil, but it also works with several third party input devices too. What makes working in Vectornator fast and delightful is its one-of-a-kind interface that gets out of the way and puts the focus on your artwork. With the latest release of Vectornator, the user interface has been completely reimagined for simplicity and speed. Among other things, there’s a new color picker and a slick new toolbar. The toolbar now has contextual options which allow you to tweak path smoothing for example. There’s also a context-aware inspector panel, so what you need is always available where you need it. The user interface is also a pleasure to the eye. Through the use of translucency it appears to float on top of the canvas. This way you get an immersive experience and what appears to be a much bigger canvas to work on. ​Their new design philosophy is inspired by their users’ workflows, built with amateurs and professionals in mind. Vectornator is the perfect place for new users to learn graphic design and grow their design skills. At the same time it offers a great environment for professionals to work for extensive hours on their next masterpiece. Vectornator adopts the latest iOS technologies to bring users the power they need to create compelling designs. For example, image layers are automatically named using CoreML and paths are rendered live with a Metal-accelerated engine. The app also includes CMYK color previews, color profiles, and integrates with Icons8, which makes over 80,000 free icons available to users. To learn more, visit vectornator.io. Best of all, Vectornator is completely free to download from the App Store. So don’t delay, download Vectornator today. Our thanks to Vectornator for sponsoring MacStories this week.